Coinmama Review  - Fast & Easy Crypto But Is It Safe? Home Guides Coinmama Review – Fast & Easy Crypto But Is It Safe? 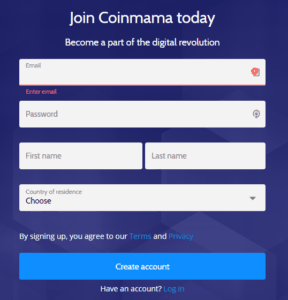 Coinmama Review  – Fast & Easy Crypto But Is It Safe? Coinmama is a broker that claims to be the 'fastest' and 'easiest' way to buy cryptocurrencies. In this 2019 review, we look at Coinmama's features, fees, pros & cons, and more. Coinmama is a straightforward cryptocurrency broker, offering users a quick and simple platform for buying a small range of popular cryptocurrencies from anywhere in the world using any fiat currency. 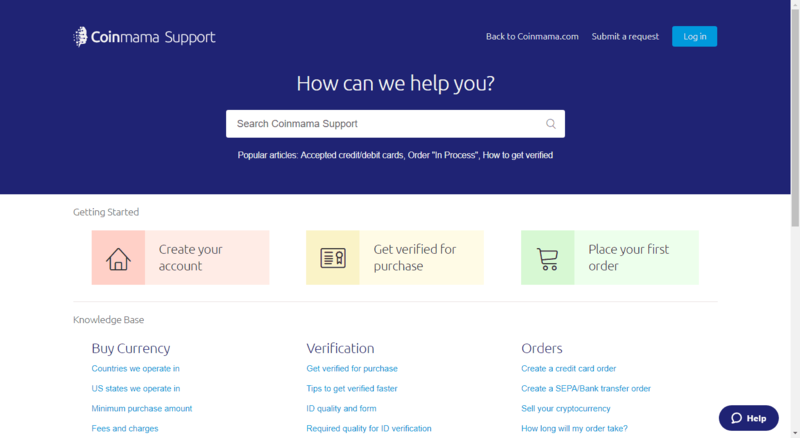 Coinmama is known for its ease-of-use and accessibility and puts extra effort into providing users with the information and support that they need to make clear and informed decisions when buying cryptocurrencies. This focus makes Coinmama ideal for people new to the crypto space looking for a platform where they can buy their first crypto coins. Given the speed of our account verification service and our support for credit/debit cards, we believe that our service is the nearest thing to instant online bitcoin purchases which a newcomer to crypto can find. Once you’ve completed the creation of a Coinmama account, the only delay will be in the processing of your card and the transfer of your newly-purchased bitcoins over the blockchain (which should only take around 10 minutes on average). If Coinmama sounds like it might be the right cryptocurrency exchange for your needs, then please read on to find out more essential details. 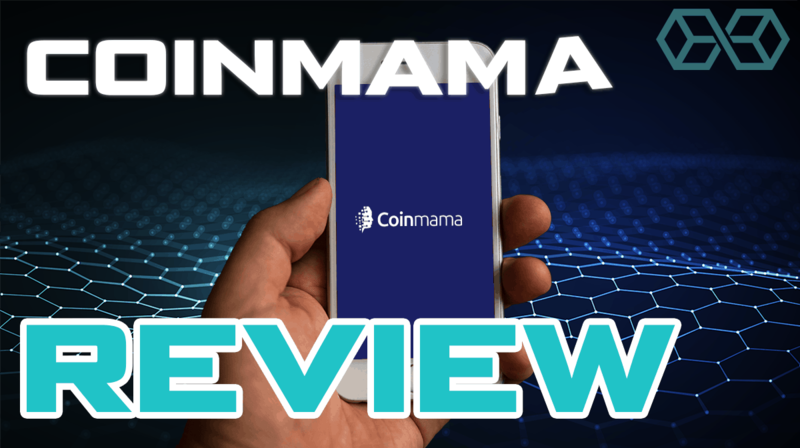 In this Coinmama review, we’ll briefly cover the basic facts about the company, the main features that make it stand out from the competition, the registration and verification process, its fees, and then a quick pros and cons list to summarize how it all stacks up. Coinmama’s features are focused on their singular service of providing a convenient platform for people to buy some of the most popular cryptocurrencies. 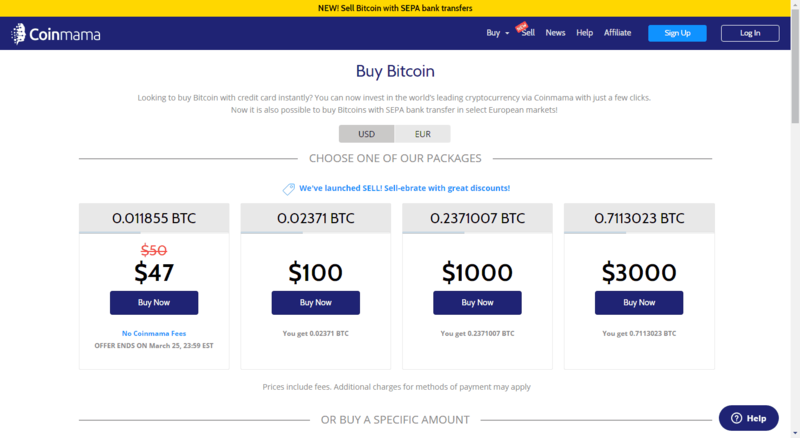 Coinmama has also recently added the ability to sell Bitcoin (BTC) for fiat currency. But currently, this is only available for European customers via SEPA payments. Coinmama offers users a quick and efficient means for buying top cryptocurrencies, such as Bitcoin (BTC) and Ethereum (ETH), using both VISA and Mastercard. Withdraw the coins into their own personal crypto wallet. For users who simply want to buy digital assets using their credit card and have those assets transferred directly to their external personal crypto wallet, Coinmama is one of the best options on the market. If you need to get hold of some bitcoins as quickly as possible, Coinmama has you covered. Coinmama lets people from nearly 200 countries around the world buy bitcoin (BTC) instantly, using any credit or debit card from either VISA or MasterCard. In almost all cases, the bitcoins will be released to you within half an hour or less. While users of all experience levels will be drawn to Coinmama’s simplicity, Coinmama puts added effort into supplying newer users with a range of knowledge and support that goes far beyond the industry standard. People new to the crypto space will be able to use Coinmama’s services with comfort and ease as a result of the intuitive interface and extensive supply of relevant guides and FAQs. In an increasingly regulated industry, Coinmama has managed to keep its registration and verification process relatively quick and simple. Coinmama has three different verification levels, each of which sets a different limit on the amount of crypto that you can buy. The first level requires that you register an account using your email, fill out a standard personal details form, fill out the details of your identification document, and then upload images of that document and a selfie of yourself holding that document. This first level of verification will allow you to buy up to $10,000 in crypto. The second verification level requires an additional identification document and a proof of residence, such as a utility bill. The second level of verification allows you to buy up to $50,000 in crypto. The third verification level requires filling out a short questionnaire about your assets and income, which will be reviewed for approval. The third and final verification level will allow you to buy up to $1,000,000 in crypto. Coinmama charges some of the highest transaction fees in the industry for its services. While Coinmama is faster and more convenient than most other options for buying cryptocurrencies, especially for credit card purchases, you need to decide for yourself whether the convenience is worth the higher fees. Coinmama’s additional credit card fees and bank transfer fees, on the other hand, are closer to the industry standard. Coinmama charges a 5.9% transaction fee. This is among the highest transaction fees in the industry. Coinmama charges a 5% credit card fee. This is the industry standard credit card fee. Coinmama has no bank transfer fee. Bank transfer or deposit fees vary widely across the industry. Obviously, Coinmama’s zero fees are the best in the industry, but many competitors also do not charge for this service. Now that we have all the necessary info about Coinmama let’s break our analysis down into some simple pros and cons. After reviewing all the essential information about Coinmama, it is pretty clear that it is a great choice for a very specific type of user, and an ok choice for many other people. 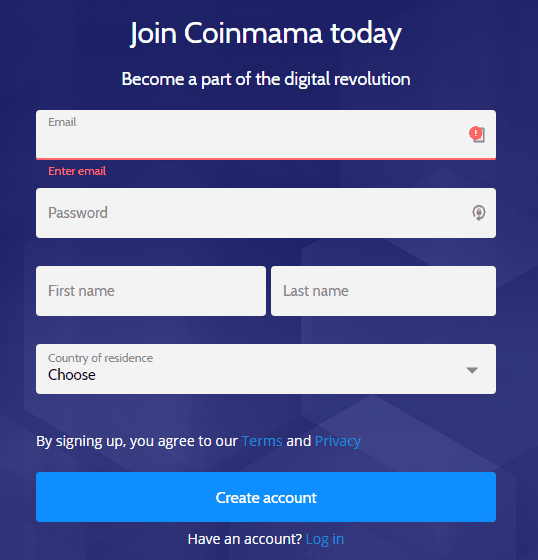 If you want to buy your crypto now without a lot of fuss and hassle and are willing to pay a premium for the speed and convenience that Coinmama offers, then Coinmama is one of the best options on the market. This is especially true for credit card users, people new to the crypto space and people who aren’t looking for an exchange to actively trade cryptocurrencies. However, this top ranking breaks down as we move away from this narrow window of user types. People who want to have their digital asset exchange and their crypto wallet in one place. They want to be able to buy, sell, and spend crypto from one convenient location. Coinmama’s lack of a wallet feature and limited selling capabilities will be a negative for many users. The 5.9% transaction fees are high, especially if you are buying a large amount of crypto. In the heady times when crypto prices are soaring this may seem like a small price to pay, but in more subdued times there are much cheaper options and many people will be willing to spend a little more time at a competitor site to save on transaction fees. The daily, weekly and general spending limits could be a drawback for some big players. People who have a lot of money to spend on crypto and are willing to pay for convenience aren’t the type to want limits on their spending. The lack of coins available for purchase may also be a big turn off. While Coinmama does have a good offering for the major cryptocurrencies out there, it is hardly comprehensive, and many will expect a bigger spread of options from their exchanges and brokers. So overall Coinmama is a good option for some crypto users and a decent option for many others. Where you fall in this breakdown of Coinmama’s services will depend on what your unique needs are. Hopefully, this review helped you to answer these questions, so you can decide for yourself if Coinmama is the right cryptocurrency exchange for you. Previous articleDogecoin Price Prediction: Will DOGE Break Out of the Triangle? Next articleLitecoin [LTC] & Dash Price Analysis – Reversal Starting for Litecoin? 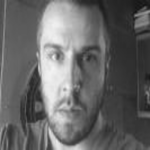 Experienced trader and finance writer, Ben spends most of his waking hours (and some of his sleeping ones) dealing with cryptocurrencies and markets in general. With an education in economics and finance and an interest in history and politics, there isn't much happening in the world of finance that he's not following.